We feature the "worlds best" slot racing birthday/corporate parties ! Last edited by professormotor; 10-03-2011, 07:23 AM. Last year at this event over $3,000 in merchandise prizes, free food and spectacular trophies were awarded. We expect also this year superb prizes for all entrants. Entries are only $5 each and you can enter as often as you wish. This box can hold 12 x 1/24 cars or 40+ 1/32 cars along with tools and other goodies. We plan to close entries and award this gorgeous box mid June. 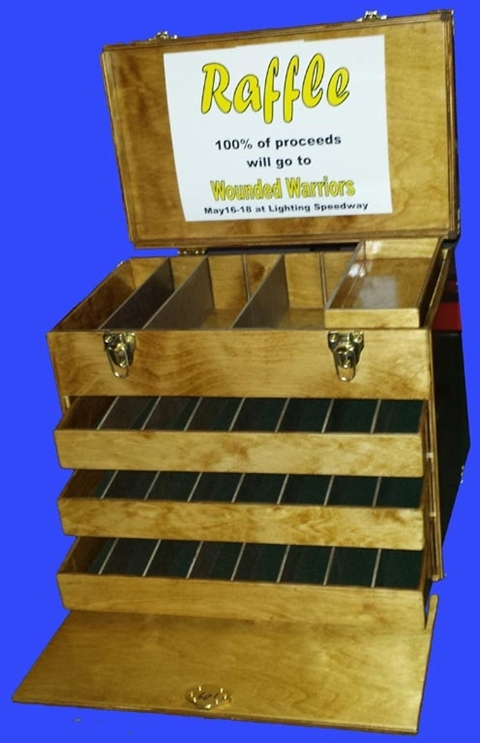 This Charity Raffle ended Monday June 16th and the box was awarded in a random drawing from the 52 entrants. One of our local racers here in MI won the box. His name is John Allard.